Maude Apatow is Joined by Her Family at 'Other People' Premiere! Maude Apatow strikes a pose at the premiere of her new movie Other People on Wednesday night (August 31) in West Hollywood, Calif. The 18-year-old actress was joined on the red carpet by her famous parents – Judd Apatow and Leslie Mann – and her younger sister, Iris. Other People is about a gay man moving home to take care of his sick mother all while dealing with his family’s strong religious beliefs. Judd Apatow Throws Out the First Pitch at Mets vs. Yankees Game! Judd Apatow throws the first pitch at a Mets vs. Yankees game on Tuesday (August 3) at Citi Field in New York City. The 48-year-old producer was joined by his wife Leslie Mann and their 18-year-old daughter Maude. After the game, which was won by the Mets, Judd took to his Instagram to share some pics from the field and joke about Mets pitcher Jacob deGrom taking some tips from him! “Look at how intensely deGrom studies my pitching style. He is always looking to learn which I think is what makes him so great,” he joked. Judd Apatow Supports Daughter Maude at 'Other People' Sundance Premiere! Judd Apatow steps out on the red carpet to support his daughter Maude at the premiere of her movie Other People at the 2016 Sundance Film Festival on Thursday (January 21) at the Eccles Center Theatre in Park City, Utah. Also in attendance were cast members Adam Scott, Jesse Plemons, Molly Shannon, Bradley Whitford, JJ Totah, Madisen Beaty, John Early, and director Chris Kelly. The movie is getting good buzz from initial social media reactions following its premiere screening and kudos are being given to JJ, who “stole every scene he was in,” according to TheWrap’s Jeff Sneider. “I was just finishing up Glee when I auditioned so I was already in twerking mode,” JJ told the crowd during the Q&A. FYI: Maude is wearing Tory Burch boots and Jennifer Meyer jewelry. Leslie Mann Brings the Whole Family to the MTV Movie Awards 2014! Leslie Mann performs a dance move on the red carpet to celebrate her arrival at the at the 2014 MTV Movie Awards held at the Nokia Theatre on Sunday (April 13) in Los Angeles. 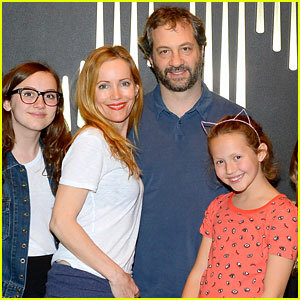 The 42-year-old The Other Woman actress brought along her husband Judd Apatow and their two daughters Maude and Iris for all the festivities! Leslie will be taking the stage later in the evening with her The Other Woman co-stars Cameron Diaz and Kate Upton – we can’t wait to see what they have in store for us! FYI: Leslie is wearing a Juan Carlos Obando dress, Saint Laurent shoes, and Jennifer Meyer jewels. Make sure to watch the 2014 MTV Movie Awards, hosted by Conan O’Brien, TONIGHT at 9/8c on MTV. Leslie Mann Celebrates 42nd Birthday in Vegas with Her Family! Leslie Mann poses for a photo with her family while attending a performance of Michael Jackson ONE by Cirque du Soleil on Tuesday (March 25) at the Mandalay Bay Resort and Casino in Las Vegas. The Other Woman actress was celebrating her 42nd birthday alongside her filmmaker hubby Judd Apatow and their daughters Maude and Iris, as well as some other young friends. This is the second Cirque du Soleil show in Vegas that the family has seen this week. They also checked out The Beatles LOVE two days beforehand.